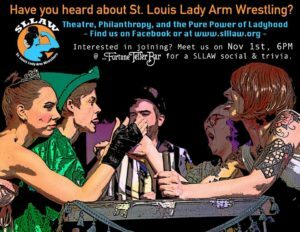 Have you ever wondered who those magical humans who grace the stage at SLLAW bouts really are? Do you want to become one yourself? Join us to find out more about how you can become involved! And come out in support of some boss babes! We’ll be throwing down some SLLAW TRIVIA and selling new merch! So even if you’re not ready to take to the stage— come out to The Fortune Teller for some tasty beer and libations, chat up a few sllawsies, buy a coloring book or sticker or shirt for yourself and your mom and all the boss babes in your life, maybe catch a couple of us smashing arms and the patriarchy, and then throw a few bucks at us to take part in some trivia.